Well that is a difficult topic today at the May Photo Challenge “Happiness”. Before I could choose a picture I had to define for myself what is happiness? According to Wolfram Alpha “Happiness is a mental or emotional state of well-being characterized by positive or pleasant emotions ranging from contentment to intense joy.” Ok, I could have come up with that. It is that content little smile when everything is just right, that giggles you just can’t stop, a short moment or a general state of mind. Am I happy? Yes I am. Not in the “everything is pink and sparkly and we all love each other every single second of the day”-way but in a good healthy way that feels like “sure, things could be better but I’m actually quite fine the way things are” contentment. Now how do I translate that into a picture left alone do I have a picture that shows just that? It was hard. I checked pictures from the last 10 years. And the picture that shows happiness the best for me is this one. Nothing special, just a night when everyone was happy. 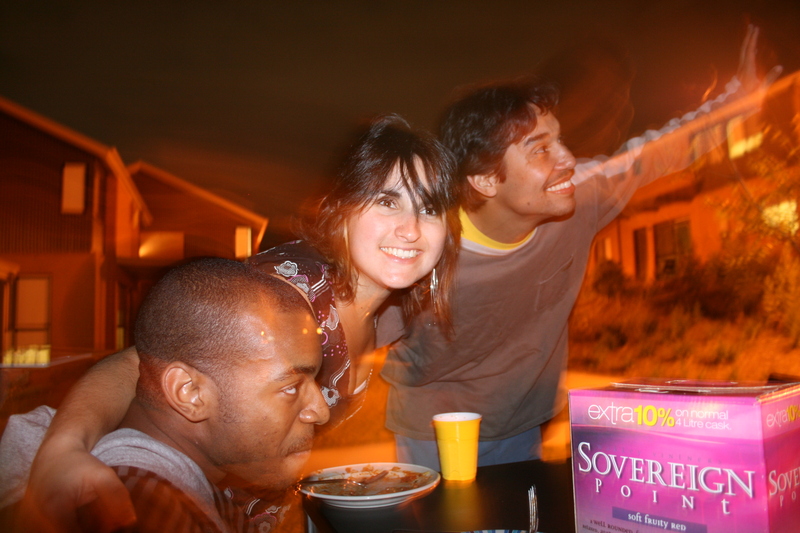 It was in Oktober 2007 in the Macquarie University Village in Sydney where we had an outdoor dinner with about 20 people where everyone brought food from their respective country. We just had a good time, eating and drinking. I still miss these times and all the people sometimes. I just met very few of them again (yet). This entry was posted in At home, Australia and tagged Macquarie University Village, May Photo Challenge by kathatravelling. Bookmark the permalink.